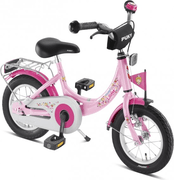 On this page find all boys and girls bikes in all shapes and sizes. From stylish city bikes and ATB models to extremely strong BMX bikes with which the greatest stunts can be taken out. Also in terms of colors and designs you can count on a cheerful bunch. Bright pink K3 bikes and bright green mountain bikes alternate. On this page, children will undoubtedly find the bike they have been looking for for ages.